This is probably my last post for a while on my old linens, that is, until I either wash and photograph what I have or buy more, whichever comes first. This of course is with the exception of the Tatted Baby Bonnet. I'm almost at the point where I have decided how to trim it, so I hope to have something more to show you soon. 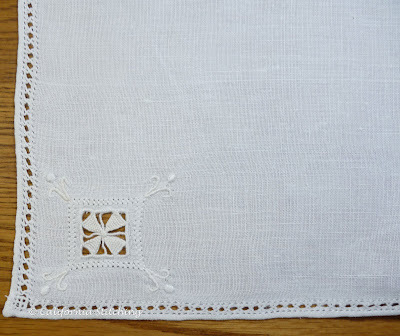 This particular handkerchief shown above is just fantastic! Look at all the detail. 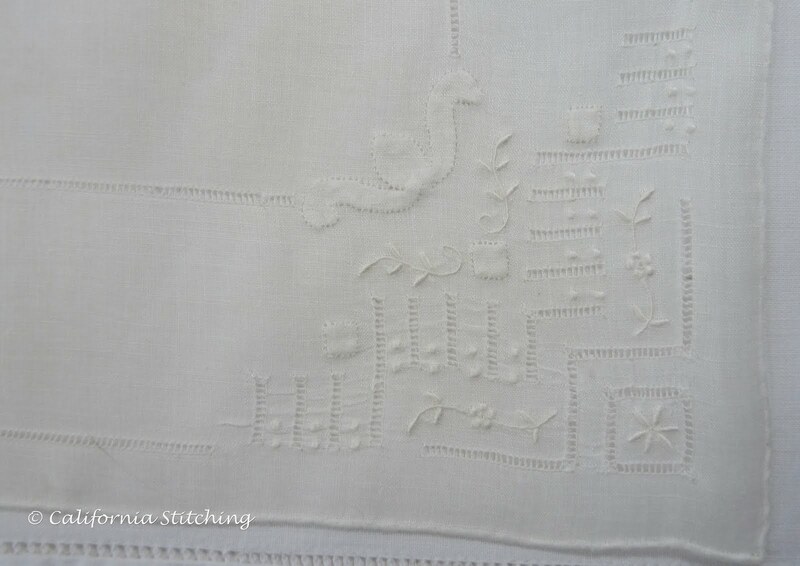 There is drawn thread work, surface embroidery, madiera applique, and a hand rolled hem! I can't imagine how many hours went into something made for blowing your nose into. I do apologize for my poor photography, I am trying to get better, honestly! 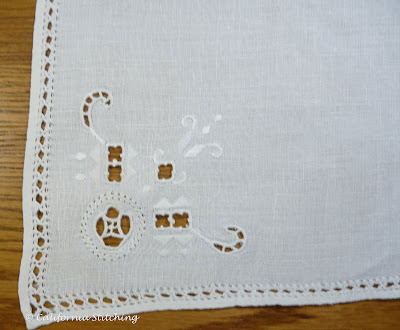 The hanky is sitting on another piece of linen with a hemstitched hem; you can just see it in the lower middle to left hand corner. I bought this piece at the same time as the Tatted Baby Bonnet. It is most likely a dresser scarf, measuring 18 inches by 47 inches. As you can see, the tatting on the right hand side is coming apart a bit. I hope to try to mend it by working a few buttonhole stitches to take the place of the tatted petal that has come apart. Here is the other end of the same side, all pristine! 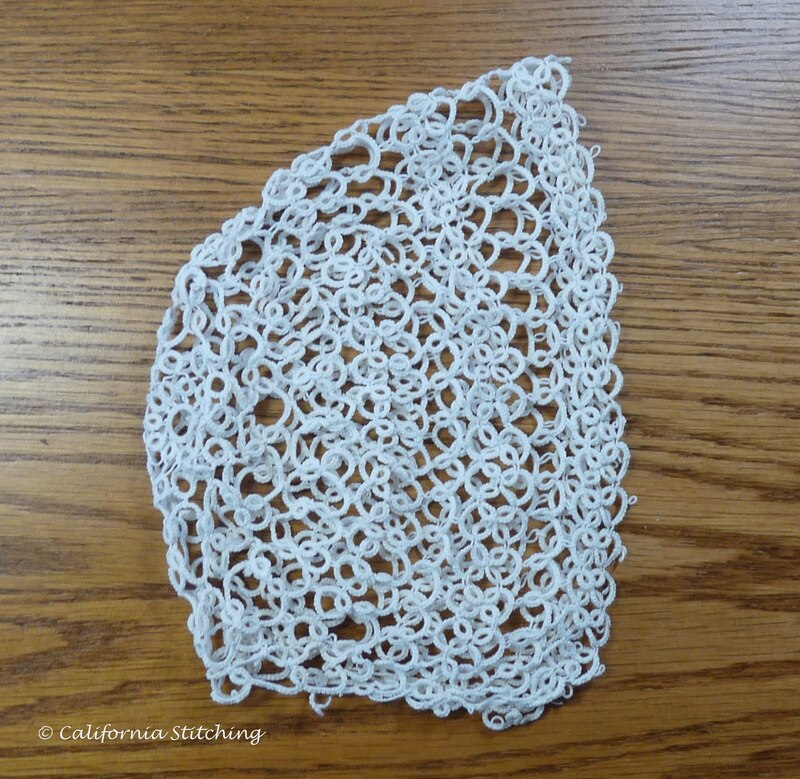 What made me think that this is a table scarf instead of a tea towel is it has a relatively enormous length of 47 inches, and the fact that both ends are finished in the same way with the tatting. Tea towels are normally fancy on one end only. At least, that's what I have noticed, but I am by no means an authority on the subject. 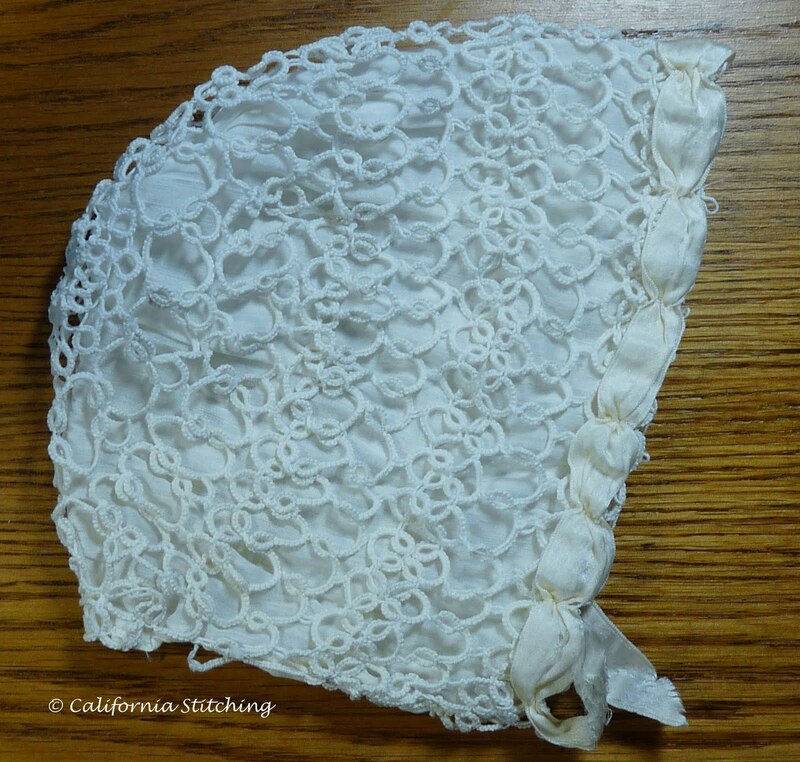 As I mentioned earlier, I am coming to a point where I have figured out how to finish the Tatted Baby Bonnet, and I'll post on that this coming weekend. I'm also beginning some darling baby outfits for two grandnieces that are due to be born in the upcoming months. I'll share my progress with you, if you're interested, as I don't care if it is not a surprise to the moms. I don't think they even know that Auntie Cindy even has a blog. Luckily, I have a five day weekend for Independence Day coming up, and I am taking July 5 as a vacation day, as I generally like to sit up late and watch fireworks on the Fourth. My employer is giving us Friday off as well, so I have a good block of time coming up to do some serious stitching! Also, I have a new project coming up, which I need like I need a new hole in my head, but couldn't resist. 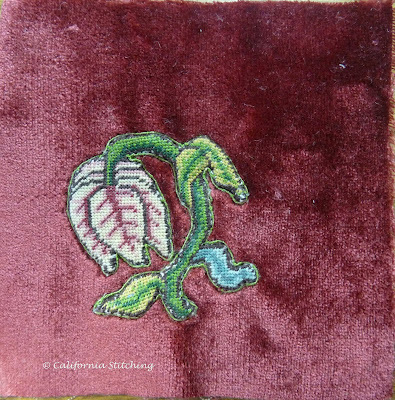 Mary Corbet at NeedlenThread.com is having a Royal Persian Blossoms Stitch Along and I just had to join! So more on that later. 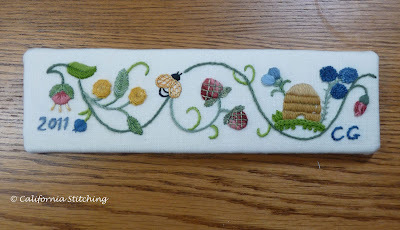 My second ever Needlework Nibble is finished! I made the little square with my initials to help offset the extremely poor placement of the tulip on the velvet as I described in the last post. 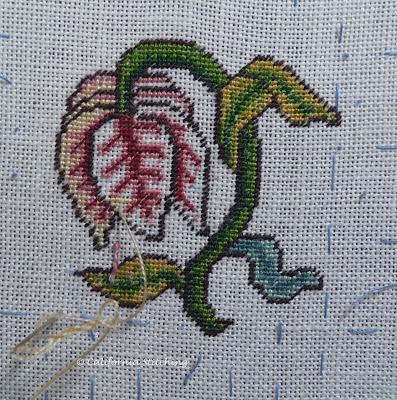 After I appliqued the initial square on, I realized that I could have just made the whole thing smaller thereby centering the tulip, as it is in the original design. Oh well, live and learn. But I rather like it this way. Notice that my gold cord corners are much simpler than on the original design. I used nylon thread to sew on the gold cord, and had a very difficult time with the loopy design on the original. So I made this really easy loop and considered it done. Now, what to do with this thing? Another pincushion? This was all done in tent stitch, which I am finding very addictive. As I mentioned in an earlier post, the thread quantities were generous, which allowed me to make the extra initial square without having to buy more floss. I really appreciate that. I would much rather spend a bit more to have plenty of materials and not have to worry about running out. While I loved the idea of the silk velvet, it's really difficult to work with. I couldn't keep the darn tulip centered, and little fuzzies of the velvet are all over the place. I really need to clean it up carefully. But the velvet is so luxurious! I just love it, so I can't really say it's a dislike. There is really nothing to dislike about this project. The instructions are clear, the design terribly cute, and it's a donation to a worthy needle working cause, the Plimoth Jacket Exhibit at Winterthur, Delaware, USA. Sometimes during the week I can rush home and shut myself up in my sewing room and stitch, stitch, stitch, but not this week. Somehow this week I had the sleepies every evening, and couldn't motivate myself do much at all. But in between car maintenance, laundry and grocery shopping chores today, I have managed to stitch for a few hours, and still have two days to go on the weekend! 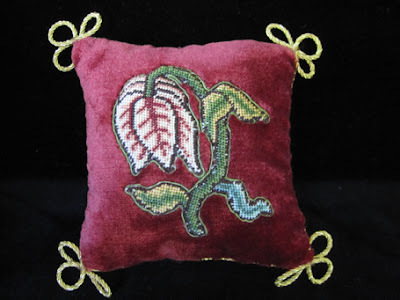 In this photo I have cut out the tulip, turned under the raw edges and appliqued it to the velvet using the brown silk floss that was used for the outline. I have just started on the additional outline using the green gimp supplied with the kit. Here is the tulip with all the gimp applied, and don't you see something odd? It's not centered! Try as I might, the darn thing kept slipping down towards the lower left hand corner of the velvet square. I can't tell you how many times I repositioned the it before I started snipping and stitching it down, and it still ended up off center! So, to add a not so subtle design element to the upper right hand corner, I decided to make a little square with my initials. Here it is with the blue guidelines so I know how big to make it. I am filling it in with the cream silk, and will applique it with a lighter shade of pink, or maybe another color. I'll decide on that as I go along. I'm using a bit of the scrap linen, sewn to some scrap cotton drill to make it fit into the hoop. The finished square will measure just over 15 mm so should fit nicely in the available space. I really need to get this finished as I just realized that my niece is due to give birth in less than a month! I have some sewing to do! 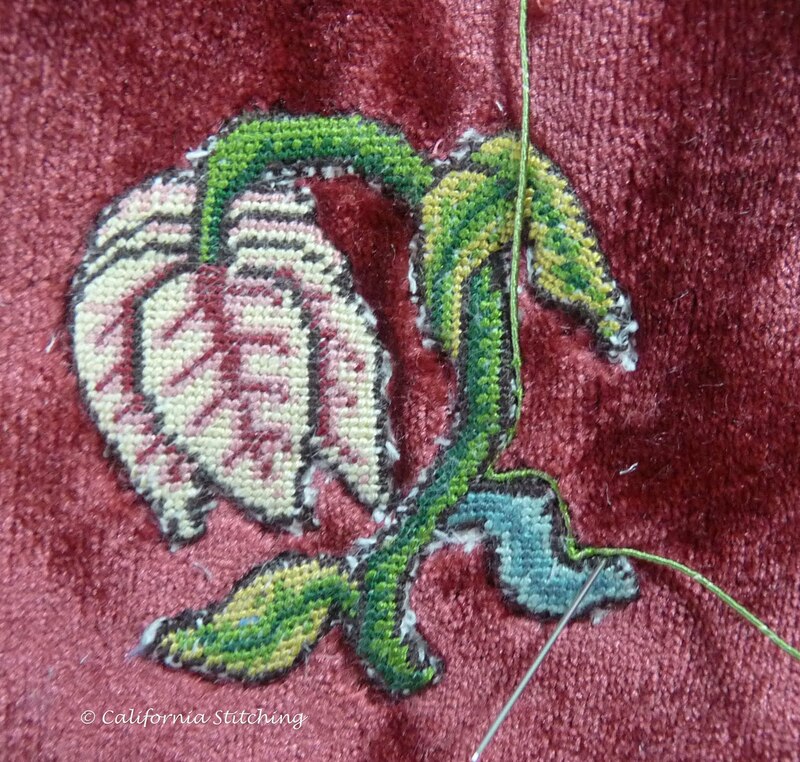 I managed to spend a considerable number of hours stitching on the Tulip Slip from the last post this weekend. My son and husband went on a male bonding/shooting trip out in the desert yesterday for Father's Day, so I was left to my own devices all day. Look at the progress I made! 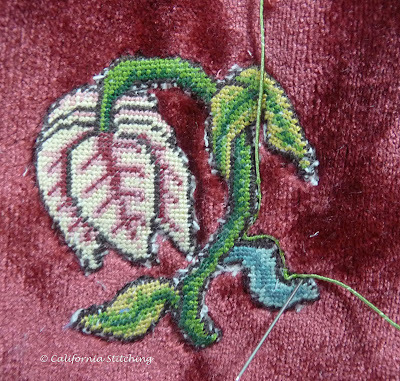 The stitching is virtually complete, with only the cream fill left on the tulip. If you look very closely, you can see where the left side of the tulip is not quite correct. Somehow I left out a row or two, but it shouldn't look too bad when completed. 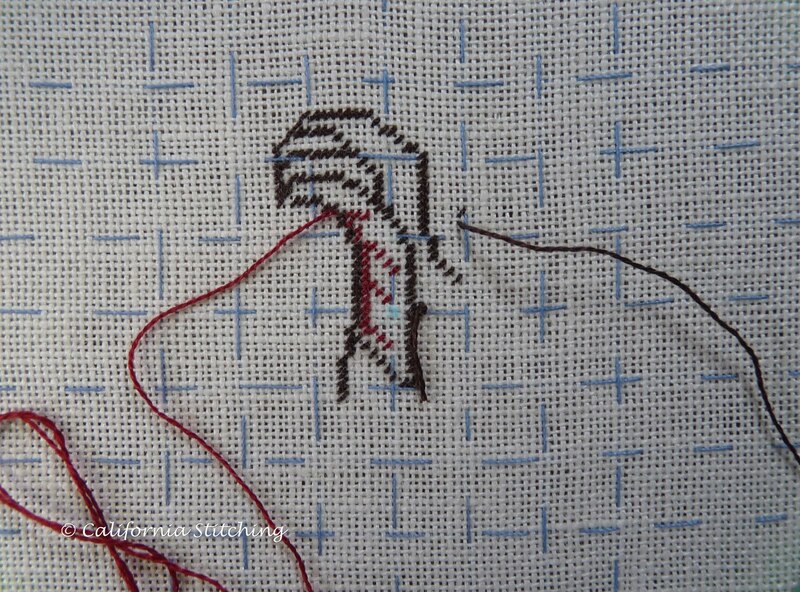 This project is counted work, actually a needlepoint type piece, and I have never done anything quite like it. I must say it's fairly addictive, so much so that I may have to dig up a piece or two that I have in my stash to work. Remember how in working my Elizabethan Pencil Box I complained about running out of threads? That definitely was not a problem with this kit! Each color of thread was supplied as a 40 inch piece, which I cut in half for stitching. I never got to the second piece, which means there is enough to work at least one, maybe two more flowers (I may run out of the brown eventually as I had a couple of false starts). 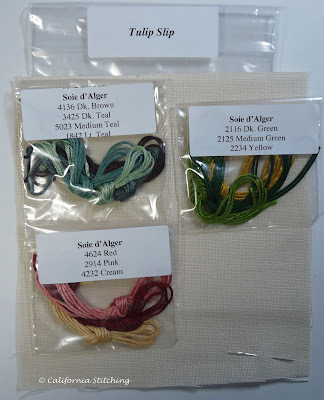 I'm starting to amass quite a collection of Au Ver a Soie, Soie d'Alger colors. It's very early Monday morning (I couldn't sleep, so decided to get up and fool around on the internet), but now it's time to get ready for work. Have a great week! Another Needlework Nibble by Tricia Wilson Nguyen of Thistle Threads is available, and of course I just had to get it. This is called Tulip Slip, and is available both as the stitched piece and a finishing kit to make the little pillow. She is selling the kits to help raise fund for the Winterthur Museum exhibit With Cunning Needle: Four Centuries of Embroidery, which runs from September 3, 2011 through January 8, 2012. Her goal is to raise $5,000 and she is already $2,500 due to sales and the generous donation of a $1,000 matching gift. With the sale of each slip, $10 is donated to Winterthur, and $5 for each finishing kit. The kit comes with a six inch square piece of 36 count Legacy Linen in Oaten Scone, a size 26 tapestry needle and the Au Ver a Soie, Soie d'Alger threads. 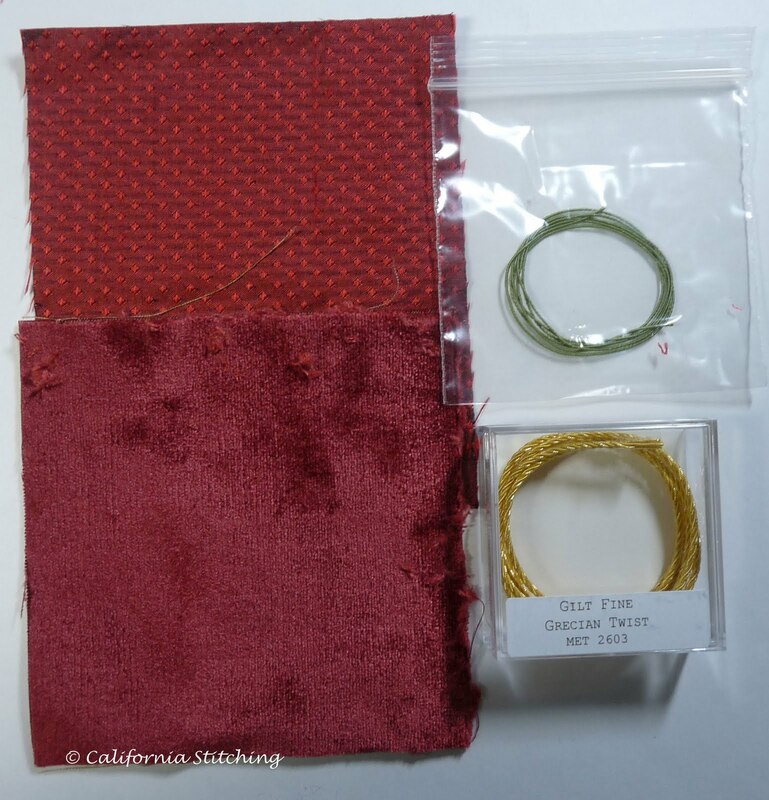 Look at this gorgeous burgundy silk velvet in the finishing kit. It's unbelievably soft, and I hate to think of the price per yard. The green gimp is to outline the slip after appliqueing it onto the velvet, and the gold is for the pillow trim. 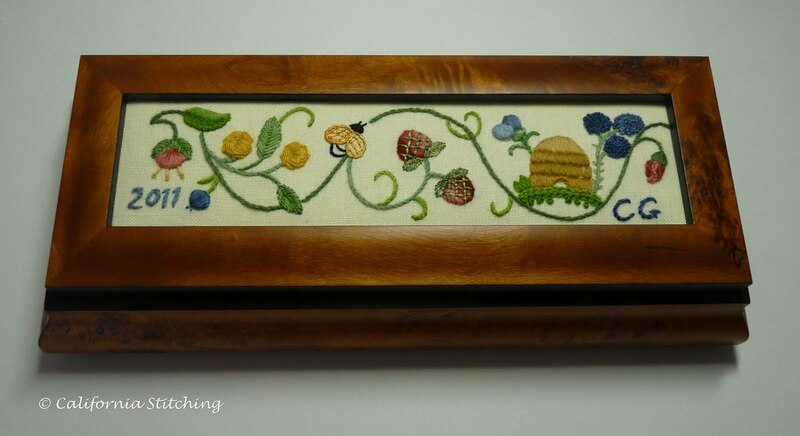 When I first started this blog, I wrote about working the Gilded Grapes, which was the first of several Needlework Nibbles I had purchased. Then I bought the Glittering Snail, which I haven't even touched. This time I was determined to not let is sit around and gather dust! As soon as it arrived in the mail I started working on it. Since I'm very new to counted work I figured I better make it as easy on myself as possible. Instead of just using center tacked guidelines, I counted off ten threads on either sides of the center and tacked the thread in rows both ways. 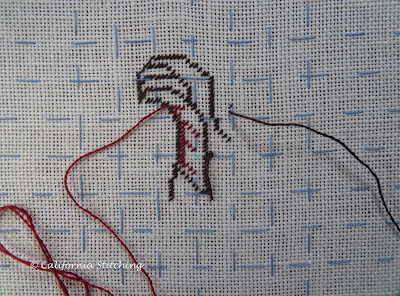 Then I started the stitching, and here is my progress after a couple of hours. 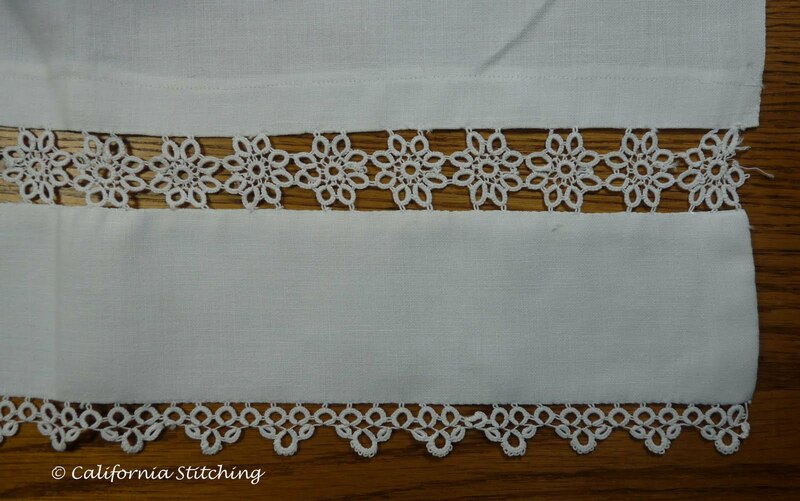 This is all worked in tent stitch with one strand over one thread. So far my tacking threads have been a huge help. I hope to get quite a bit done to show my sewing guild on Monday evening. These kits are great little projects, just right for trying something new and for gifts. But my problem is that I never want to give them away - I like them too much. But now it's Saturday morning and time for all the usual weekend chores, especially if we want to eat and have clean clothes! Have a great weekend - and I hope you wish a Happy Father's Day to all the significant Dads in your life! 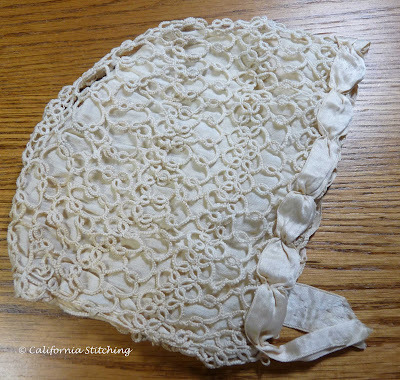 To refurbish this delicate bonnet, I very carefully detached the lining and the silk ribbon from it, and washed it again in a mesh bag on the delicate cycle. The lining was so fragile it tore apart as I was detaching it. The ribbon held up slightly better, but was showing significant wear around the stitching holes. I have a significant store of scrap fabric, so I cut a piece of cream colored satin batiste, approximately 13 by 5 inches long. I folded it in half so it measured 6 1/2 by 5 inches, and made a French seam on one edge, then narrow hemmed the others. I gathered the seamed edge so it would fit into the bonnet, then carefully hand stitched the lining to the bonnet, gathering the lining slightly to fit. Here is the lining stitched to the bonnet, and stuffed with batting to make it sit up nicely for the photo. 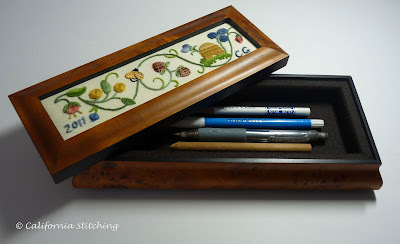 I finished my Elizabethan Pencil Box today, and managed to mount it into the box. Of course, I only had a vague idea as to how to go about this, but I remembered Ruth O'Leary's great post on the subject last year and went to it for guidance. Tanja Berlin also has excellent instructions on her post, so I used both to figure this out. I was so absorbed in this that I forgot to take photos, but it is pretty boring. If you want to know how to do this, please go to Tanja's or Ruth's postings and you'll get a much better instructions than I could give you. First of all I went to Michael's and bought a package of the acid free Foam Board for $9.99 for two 20 by 30 inch boards. 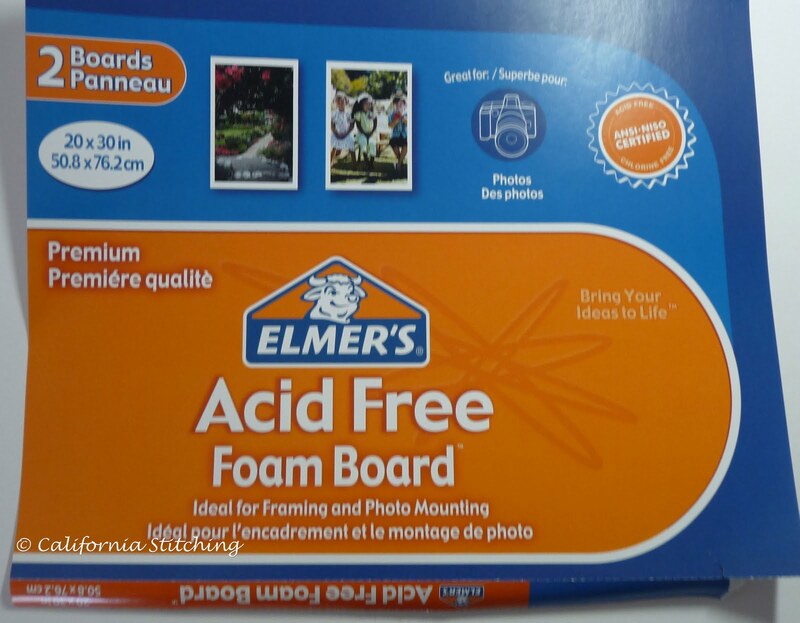 I had considerable help from one of the guys I live with (my son) as he used to work in the framing department, and told me to make sure I ask for the acid free board. I cut a piece 1/8 inch smaller than the opening (this from Tanja's directions), and trimmed the fabric and a piece of scrap cotton batting to fit. I had to use the rotary cutter for the foam board, as I don't even have an X-acto knife. But since I knew I was going to use the batting I wasn't too worried about it being a bit uneven. I will need to get a knife next time I go to Michael's. Then I sewed the ends together to make it nice and tight. If you look at the two posts I reference you'll see my version is not quite as crisp around the corners. These will be covered up, so I'm not bothered by them. But I certainly have room for improvement. Here is the front, not quite centered properly, more room for improvement here! And the final box. This is way too nice to bring to work. I'll leave it here at home, downstairs in the living room somewhere. There is not enough thread for some of the colors. I didn't have enough of one of the greens and had to use a different green than what was indicated in the instructions. And several times I was sweating over whether I would have enough of a color to finish the part I was stitching. But I do have some of the lovely Gumnuts Poppies in blue left over, and I have an plan for those scraps. The fabric comes silk screened in a heavy green, which is sometimes difficult to cover. This is especially true for the bee's wings, which are worked in Pearsall's gold variegated silk floss. Even with two strands it was I can see some of the green peeping out. I would have preferred a grey drawing, as was provided with the Trish Burr Chinese Flower Kit I recently finished. But all in all, this was a fun kit to make and I will work several more of them. I almost forgot... the RSN Crewelwork Essential Stitch Guide I ordered came yesterday! The day after I ordered it. The Amazon site shows it will be delivered tomorrow. They are too efficient! 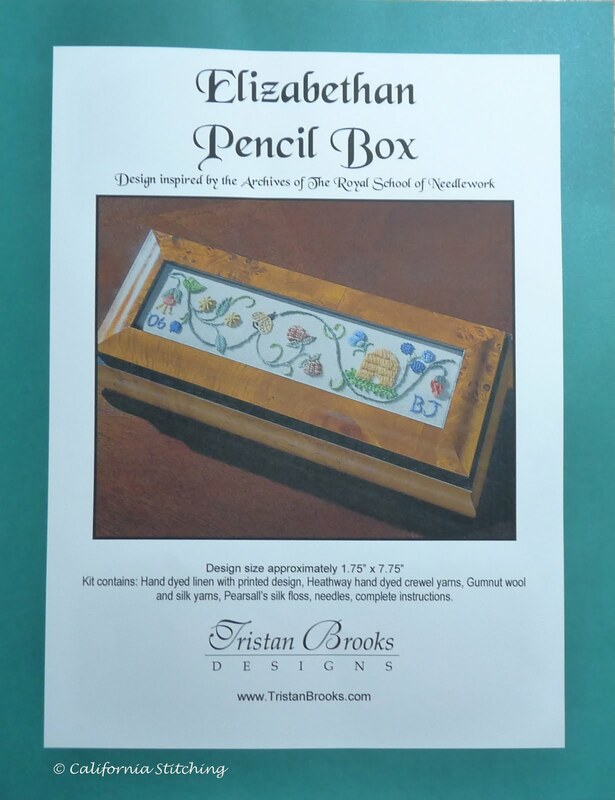 Yesterday was my Friday off and I decided to start on the Elizabethan Pencil Box that I wrote about on my last post. I've made some progress on it, and if I work very hard and steady on it I should be able to finish is this weekend. 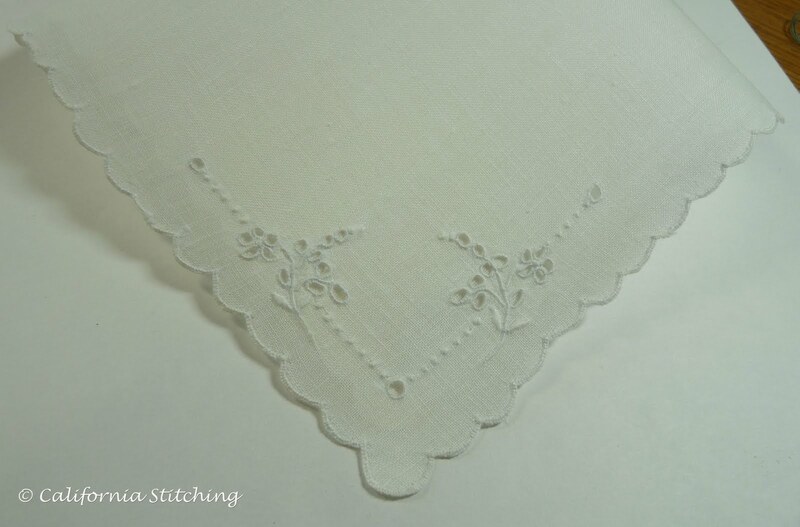 The kit came with a strip of the fabric with the design stamped on it, and I attached it to the much larger piece of muslin also in the kit. I mounted this in my large hands-free hoop for stitching. The kit recommends taking the work out of the hoop to avoid hoop marks, but this will be cut down in side any hoop marks so I won't bother. And another treat! I was rummaging through a pack of magazines and found a $15 Amazon gift card left over from Christmas. So I looked on Amazon and found the RSN Crewelwork Essential Stitch Guide for only $14.93. Since I have Amazon Prime there is no added shipping. Needless to say I ordered the book and it has already shipped and I should have it by Tuesday. Now, what to do with the other 7 cents? It is Saturday morning and now time to do all the normal Saturday things, such as laundry, grocery shopping, sorting through mail, exercising (I'm trying to recover my waistline!) and so on. I've even been scrubbing the grout on the kitchen floor tiles. 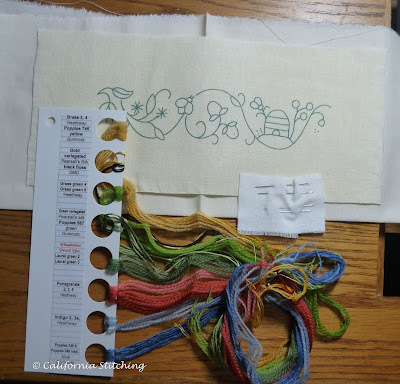 I should be able to get in an hour or two of stitching this afternoon, and will post when I finish the stitching. Well, actually my birthday was a few weeks ago. But I just received my gift in the mail earlier this week. (l left the cellophane on it, so please excuse the glare). It's a pencil box! But not just an ordinary pencil box, but one made to go with the following kit. In January of last year we drove to Sacramento for our niece's wedding. We spent a few extra days there so I had to take a side trip to Needle in a Haystack in Alameda. I purchased this kit, but they didn't have the box to go with it. This year I decided that having the box would be a perfect birthday gift for me so I could make up the kit and have the classiest pencil box that anyone at work has ever seen! 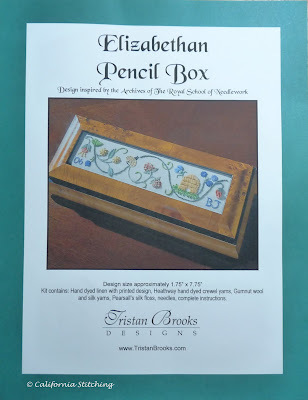 The kit is a design that is inspired by the archives of the Royal School of Needlework and is produced by Tristan Brooks Designs, which specializes in Crewel work and has had some of their project featured in Inspirations Magazine. If you recall, I managed to work on a Newbury Small project while on jury duty in February 2010. The kit contains several different yarns. I think the idea is for the student to get acquainted with several different threads to better know how to use them. I plan on starting this soon and will be sharing posts with you - for good or bad. Today I will share a great Antique Mall find. Last Friday I left work early for an appointment, but overestimated the amount of time I would need to get there. And for once, the traffic wasn't too bad at all. So I found that I had about 20 minutes to spare, and just happened to exit the freeway near an antique mall close by my house. I generally try to stay away from it, as most of the time I spend way too much money buying things for which I have absolutely no need or use. But I love to browse through it to try to pick up any of the things I may be collecting (which are not many, honest!). 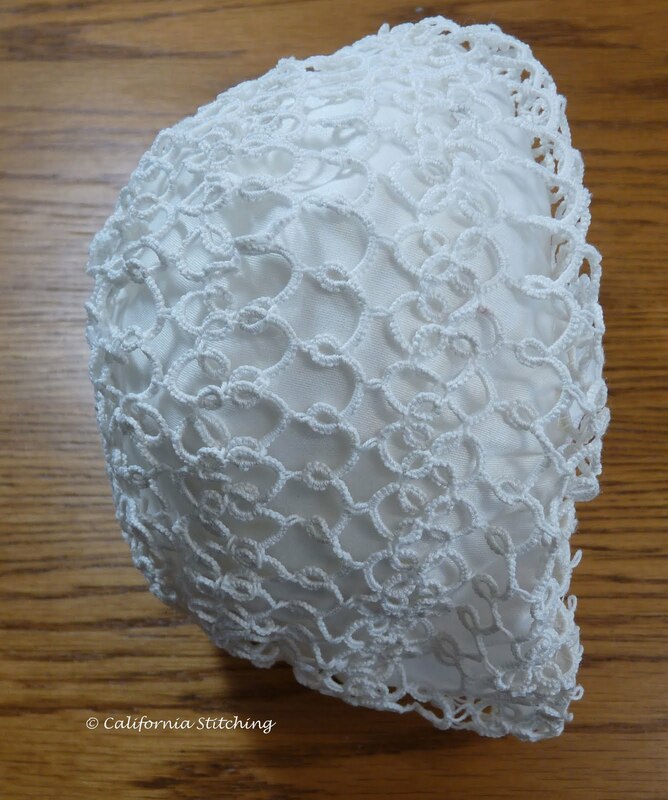 Halfway through the mall I came across this baby bonnet and couldn't believe my eyes! It is all tatted! 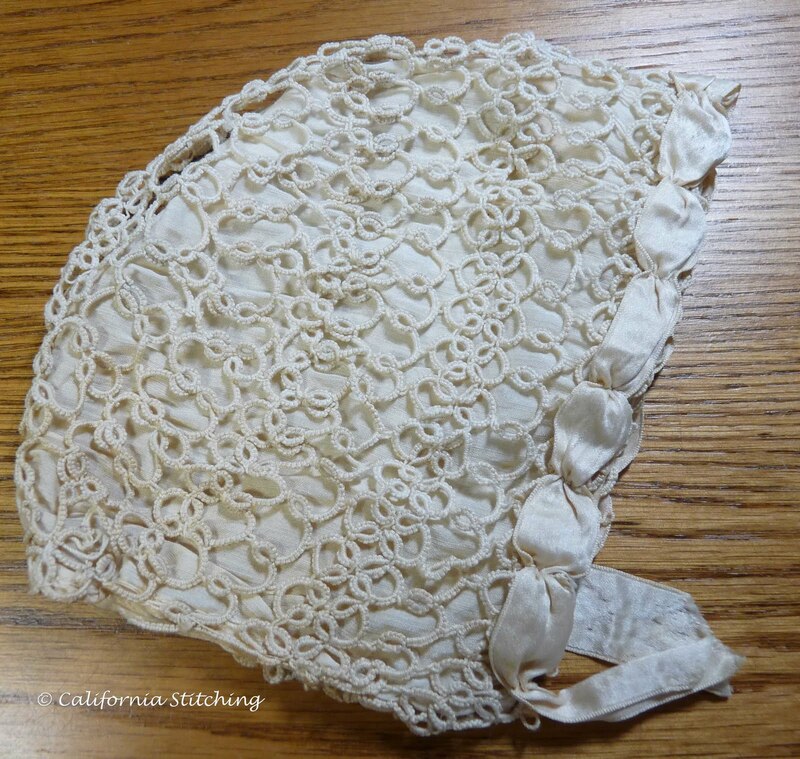 It is lined with what looks like cotton, or maybe silk, batiste and trimmed with a bit of silk ribbon. 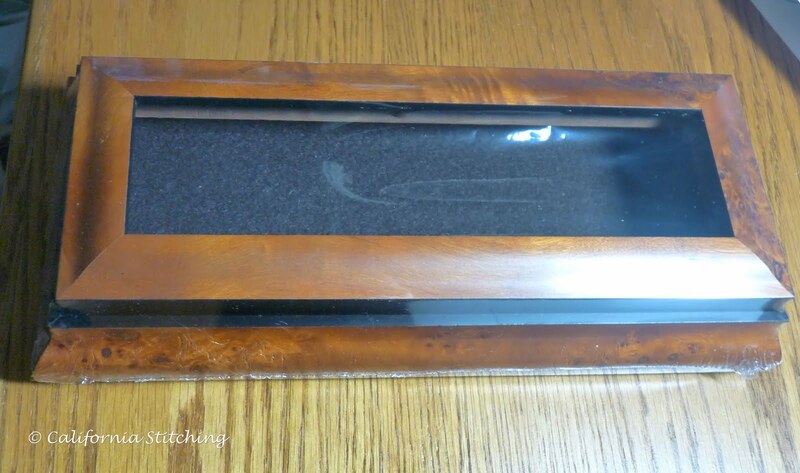 The photo above is as I found it, which was a dingy orangey-brown color with a few extra stains around the back. I took the poor thing home and soaked it in a very high concentration of detergent with oxygen bleach (I use Kirkland High Efficiency powder from Costco and OxyClean) for two days, then tossed it in a mesh bag and laundered it on the delicate cycle. I know the photos aren't the best, but look at the difference! It's really amazing how nicely it cleaned up. In real life the contrast in color before and after washing is much greater. The lining is a bit ragged, and the silk ribbon on the outside is very ragged and coming apart, so I think I'll replace both. 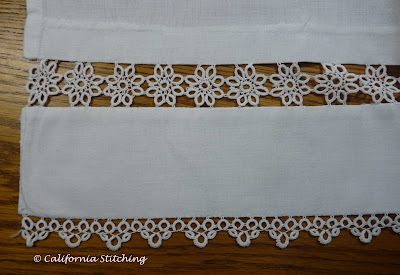 I may use cotton or silk organdy for the lining and a longer ribbon for the trim, add some ties and maybe a flower at the base of each side. The tatting itself is in perfect condition! After all, it is knotted cotton thread which is pretty sturdy. And best of all, this cost me $14.00. 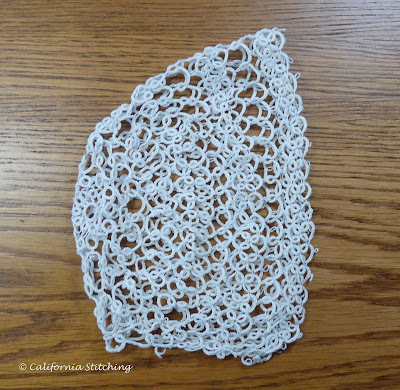 Considering the time that went into making the tatting, it is truly a bargain. I have no idea what I'll do with it. Maybe I'll just mount it on a bonnet mount and look at it. I just love it, especially as I'm sure I'll never learn to tat. 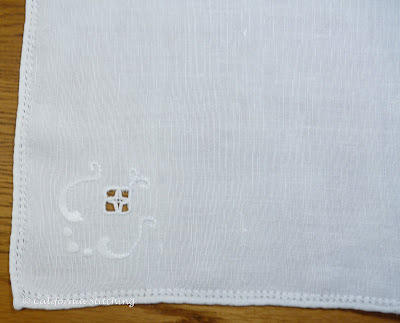 Old Linens II - Lefkara Linens? 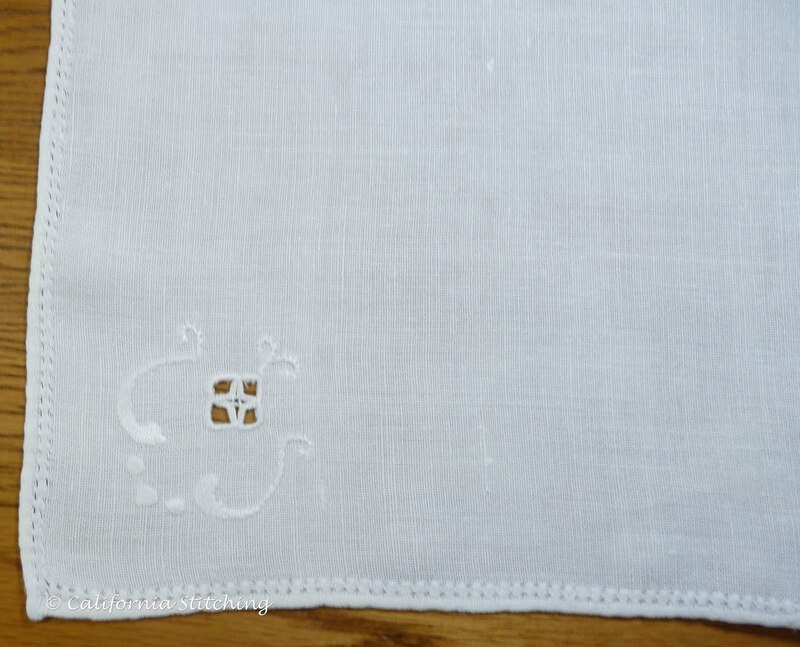 Last week Mary Corbet wrote about some linens she had purchased that she suspected were Lefkara Linens on her NeedlenThread.com site. I left a comment that I had some similar linens and would post about them when I got some photos. Well, here's the post! The photos are a bit fuzzy, but not too terribly bad. 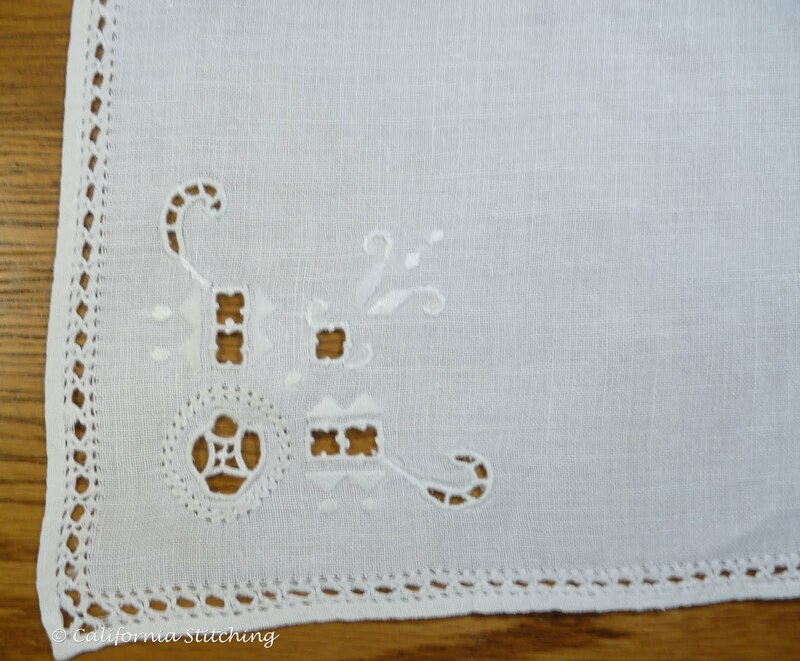 Several of the commenters on Mary's post wondered if this could be Hardanger, but look at the scrolls and circular motif on this one. Definitely not Hardanger, which is all blocks and straight lines. (Like I know anything about Hardanger). Don't you just love that hem? This is a much simpler motif, with a similar hem. 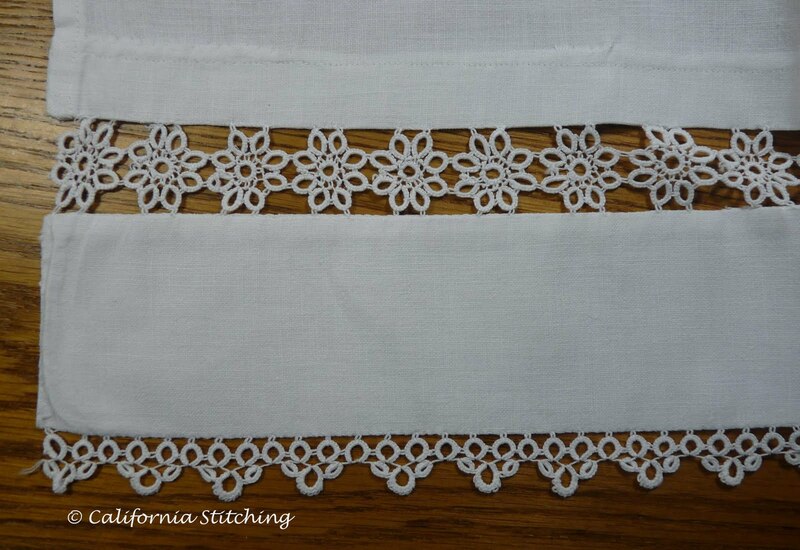 I especially love the needlelace insert. And here is a yet simpler motif with a much simpler hem. Wouldn't you know that I have several of these, but only one each of the first two? So take a look at this quilt that I made and posted about last September. Notice that I cut up the fanciest of the pieces I had to incorporate into the quilt! Oh well, it still looks lovely. As I recall, there were some stains on the piece so it wasn't such a crime to cut it up. When I buy some linens that have stains I generally soak them in detergent and oxygen bleach for a day or two before washing, and usually all the stains come out, but then some are pretty stubborn and these were no exception. I have to admit my photographic skills have improved quite a bit since I took that picture of the quilt. Do you ever cut something up and wish you hadn't? I don't wish I hadn't, but still, I could have been a bit more education as to what I had in my possession. I finally got this little bitty thing finished, and I have to admit that it is sort of cute. If you remember my really annoying, whining post I was upset with the fact that I was spending time on this instead of some Serious Embroidery Project. To give credit to DMC, I got the pattern from their blog. This is in no way original. Remember, I'm the one without a creative bone in my body. I did change the embroidery a bit, but not much. I added chain stitches to the top of the pink scallops, and embroidered a rose on top and rose buds on the two lower layers. In the scallops I just put a simple french knot. It seems awfully fat with the stuffing in it, so I cut out a circle of Peltex and stitched it to the bottom to give it some stability. So now that I've completed this, I think I actually like it. But, I would want the sides straight, rather than bowed out. So maybe a strip of Peltex is in order for the sides. This would, however, prevent the users from sticking pins into the sides making the top the only really "pin-stickable" portion. But that may not be a bad thing. Many, many years ago I took cake decorating classes at Michael's and absolutely fell in love with the Joseph Lambeth school of cake decorating. If you recall, the wedding cake of the Duke and Duchess of Cambridge (Prince William and Princess Catherine) was decorated in this style. 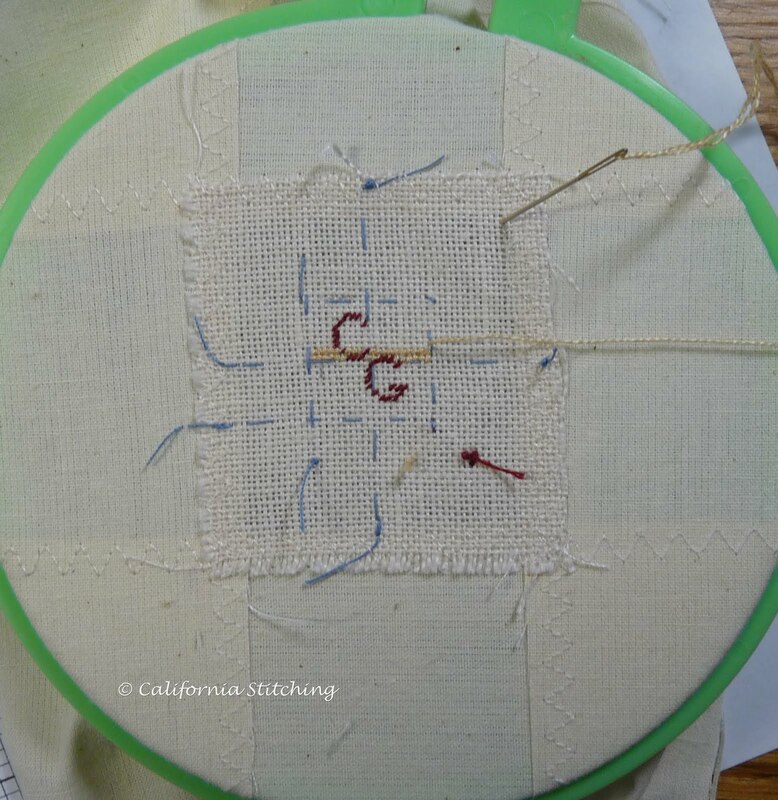 So, if I really get energetic, I would try to make a pincushion in the Lambeth style. But I doubt I would get around to it, as there are just too many other things to occupy my time. If you really want some unbelievably cute pincushions, check out this site. It's Monday morning, and time to go to work! Have a great week! 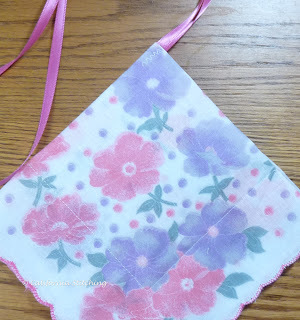 This is a quick and easy way to make lavender sachets that are pretty enough to hang in your closet. First, choose a hanky. 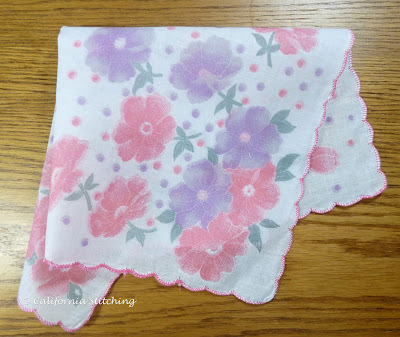 This is a "vintage look" hanky that I bought on eBay. They are pretty inexpensive. OK, they're cheap. They were less than $1.00 US each and that included shipping from Hong Kong. 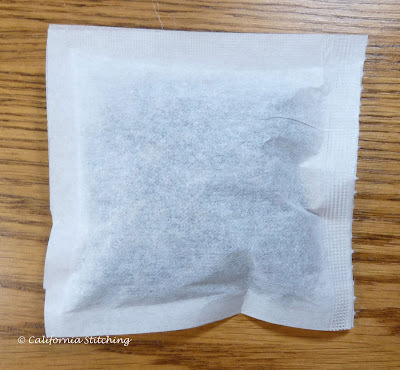 Remember the tea bags from the Lavender Sachet post? 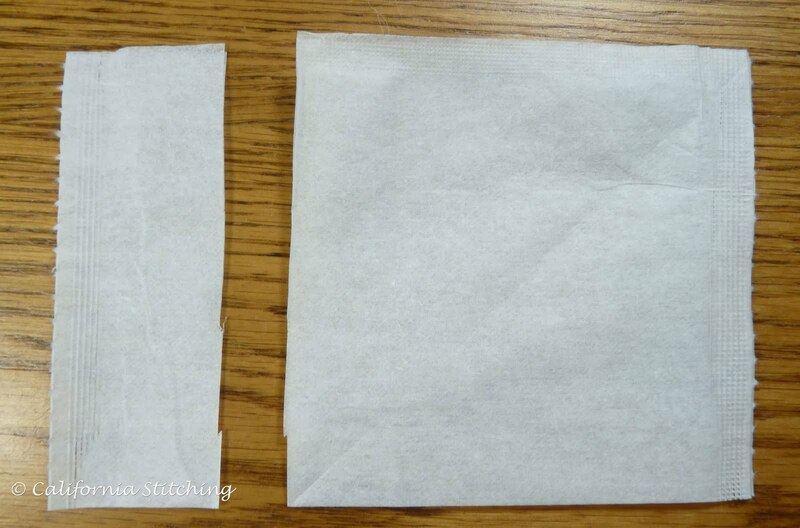 You need to make them square, so fold on the diagonal and press to find the amount to cut off. Then cut off the excess. The bag will now only be sealed on two sides. Iron one side closed. Fill with lavender, home grown if you have it, and iron the fourth side closed. 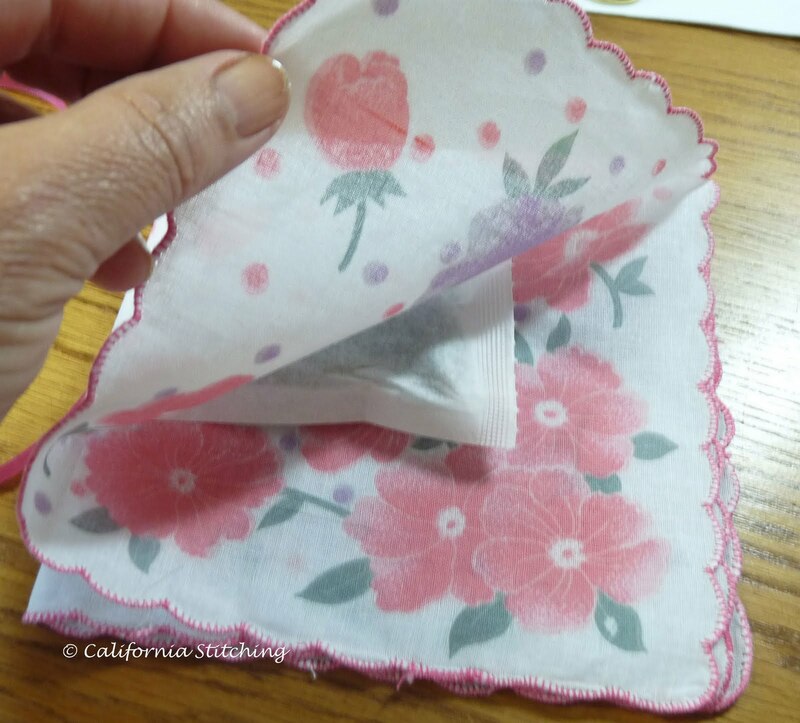 Fold the hanky in quarters and slip the lavender tea bag under the first fold. 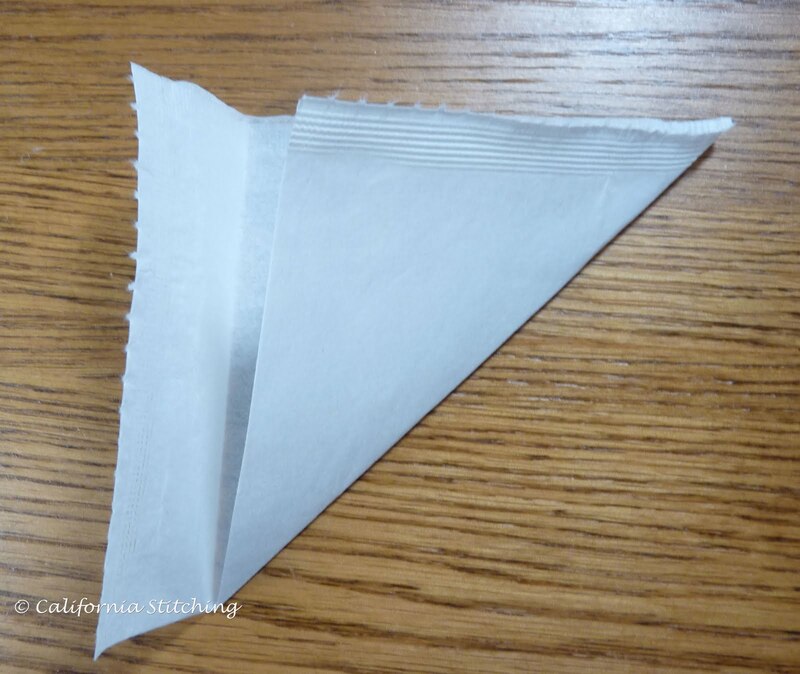 Cut a length of ribbon and slip the cut ends in the middle of the folded hanky. I used 32 inches, but you can adjust to your liking. 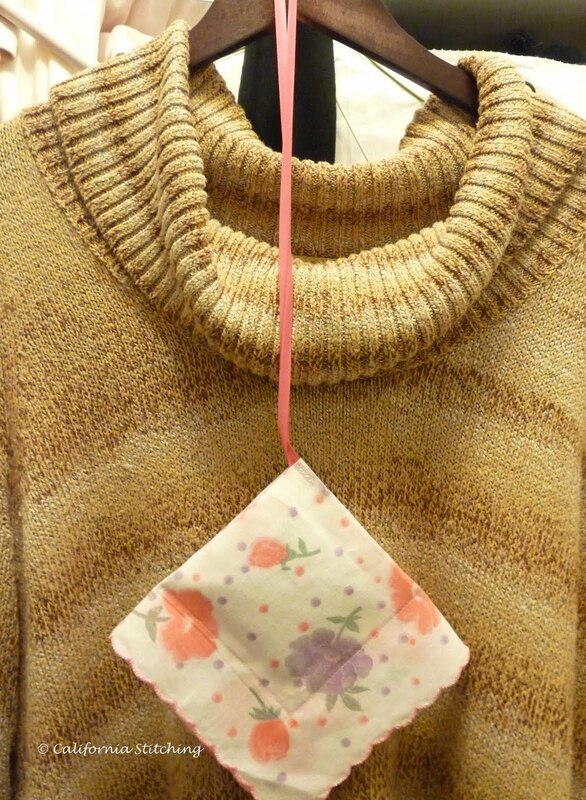 Zigzag the ribbon in the fold, then straight stitch just outside the lavender tea bag to enclose it. And here's the finished tea bag hanging next to a sweater. These are quick and easy enough to make a bunch in advance to enclose in a gift bag for someone. They would also make great bridal shower favors. If you want to get really fancy, you can use silk ribbon and lacy or embroidered vintage handkerchiefs. 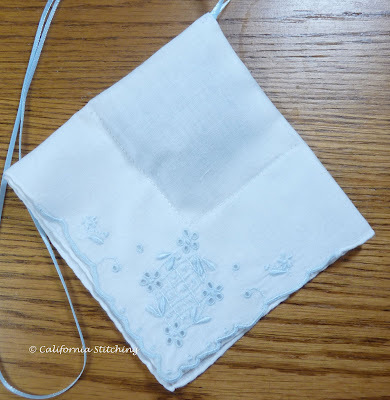 Here is a pretty blue embroidered hanky that had some stains on it I couldn't get out, so this is a nice use for it. I was able to fold it so the stains wouldn't show. Cute, aren't they? 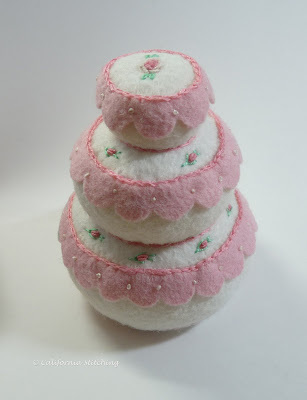 As I'm still fooling around with the felt wedding cake pincushion, and would bore you to tears if I wrote about my progress, I'll share with you some of the linens I collect. I will often go to antique stores and will buy handkerchiefs and hand towels just because I love them. Usually I really have to restrain myself to keep the budget from bleeding too much! 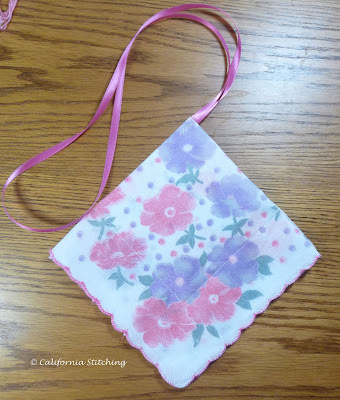 But sometimes I have found some absolutely gorgeous hankies, and this is one of my favorites. 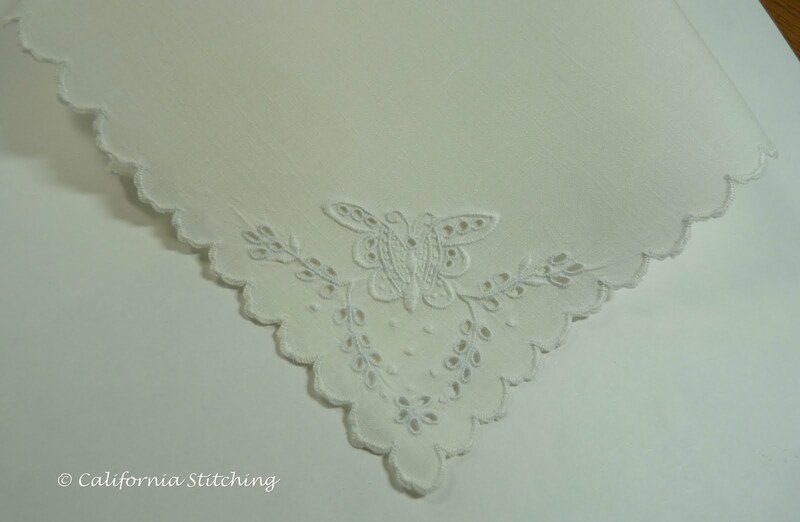 Look at that beautifully stitched butterfly with the satin stitched outlines. Don't you just love all those eyelets? There is no way I can make them that well. But what is really flabbergasting about this is the scalloped hem! It goes all the way around the hanky! 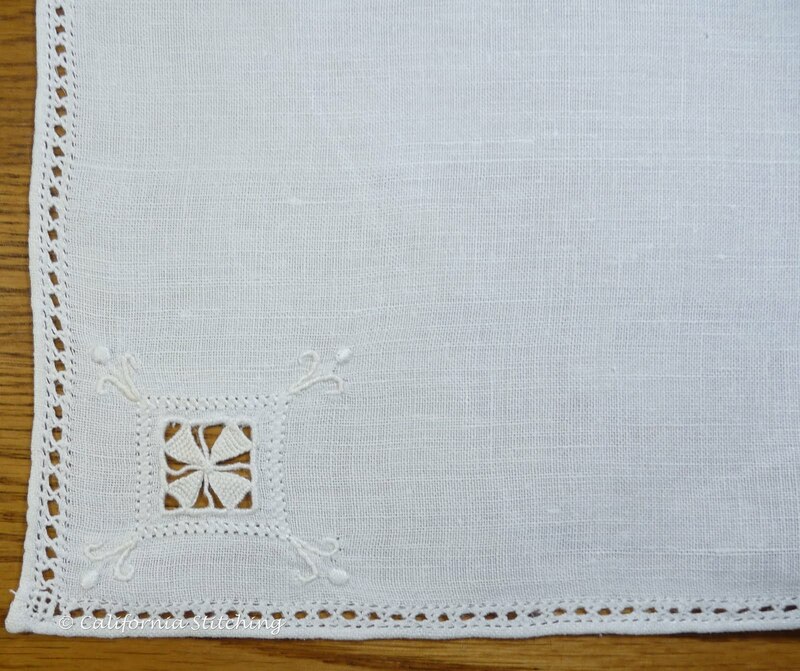 To top it off, each corner has a little design, just some simple eyelets in a flower arrangement with granitos. The execution is excellent and the hanky is in marvelous shape. The fabric is a moderate weight linen so it has just a bit of heft to it. The thread seems to be either cotton floss or more likely, a very light weight of coton a broder. This little one is having some raveling issues in the design corner, but other than that it looks pretty nice. This fabric seems to be a cotton batiste so it is a bit lighter in weight than the first one. But being such a fine cotton it really lends itself to the techniques used here. The medallion with the two side "wings" are made with Madiera applique, all very tiny and pin stitched by hand. In the center of the medallion there are two "bananas" that are made with shadow embroidery. 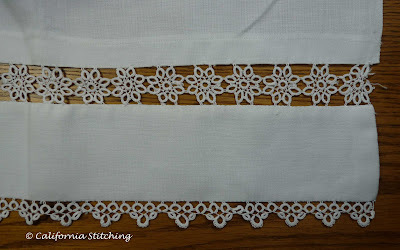 The hem around the embroidery is a scalloped hem, but the rest of it is hand rolled, another technique that I find fairly difficult. 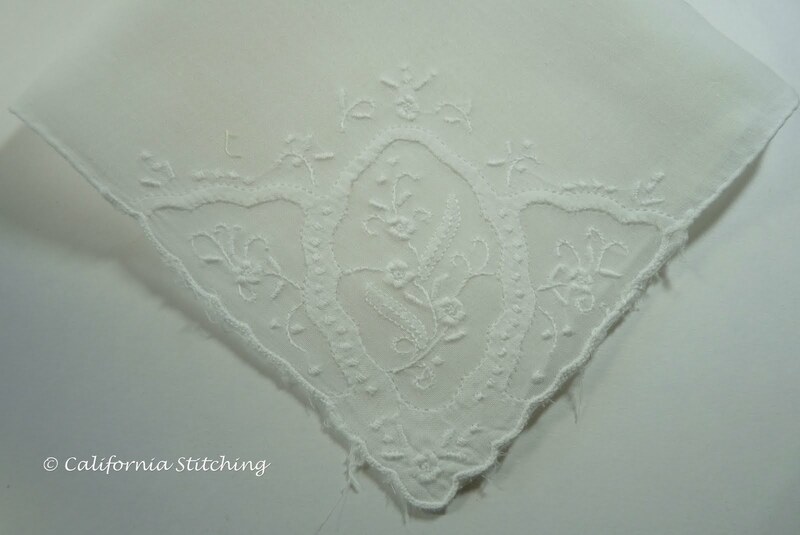 The rest of the embroidery is very simple, just stem stitching and satin stitching. This seems to be worked in a single strand of floss. Every once in a while I'll host a bridal or baby shower, and I'll get all of these out and use as napkins or even coasters. They all tend to wash up fairly well, and I've had no problems with stains. But then, I suspect my guests are all especially careful around them. I have quite a bit of other items that I'll show you from time to time, especially when I don't have good progress to report on a project. PS. 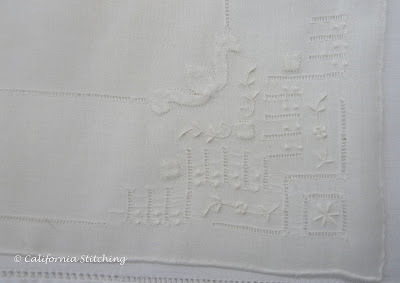 I wrote this post on Tuesday evening, then on Wednesday Mary Corbet of NeedlenThread.com posted about vintage linens. I have a few that look very much like hers, and will post about them as soon as I get them photographed.